This is the final post in a three-part series about traveling on the California Coast. Part 2 covers Morro Bay, where visitors can go whale watching, Embarcadero shopping, winery tasting, check out the Museum of Natural History, and cruise/dine on the luxury yacht, Papagallo II. Part 3, which you're reading, discusses Avila Beach and Pismo Beach. We spent the final night of our Central Coast trip in the small surfside town of Avila Beach, about a 25-minute drive southwest of San Luis Obispo. This little town was founded as a shipping port in the middish 1800s and was known for its funky charm for decades. But in the early 1990s, a massive oil spill from resident Unocal oil storage facilities created huge contamination issues. After a $30 million settlement, the contaminated soil was removed and replaced with clean fill—a process that took years and involved the destruction of many buildings (a few old wooden buildings were moved away for the duration, and then put back into place). houses, and a few small hotels. The new buildings sport a hybrid Mediterranean/post-modernistic look that blends in beautifully with the landscape and the few older buildings that survived the contamination repair. Charming and artsy, Avila Beach is a popular summertime destination for locals and visitors from other parts of the state. 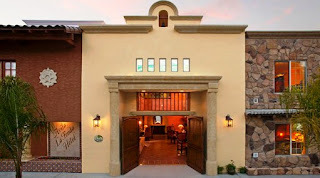 I stayed at the lovely, art-filled Avila La Fonda. The art here isn't the kind hoteliers might buy at a place like, say, BoringHotelArt.com. This was real art, created by real people, with pieces picked out one by one for a specific room or location (all the rooms are individually decorated). The Avila La Fonda contains stained glass windows (not too many; just enough to delight the senses) and a lot of extremely nice tile work. Perhaps most important is the hotel's generous spirit. There’s an entire wall-sized bookcase filled with DVD movies, CD audio, and books that you can browse through, picking what appeals for taking back to your room…for free, and you don’t have to sign your life away in the process. My room had a high-end Bose radio/CD player, a big-screen HDTV, and a good-quality DVD player, and I loved that they weren’t nailed down to the furniture. Off the lobby there’s a small lounge area with comfie seats where you can sit and read a book or gaze at the fireplace; coffee, fruit, juice, and snacks are always set out. And in my large, spacious room was a big basket filled with snacks: fritos, candy bars, popcorn, gorp, all sorts of things. There was no charge for the contents—they were there for the guest to enjoy, just as they are in each and every room in the hotel. Another plus: my room had a fridge and microwave. BTW, here’s a new discount twist: instead of 10% off for being a member of AAA or AARP, the Avila La Fonda Hotel offers Costco members a rockin’ 30% off. Now that’s a discount! That night we dined at Steamers of Pismo—part of a legendary local empire, McClintock’s, which was founded in 1973 by Bruce Breault and Tunny Ortali. The two young men purchased a 100-year-old roadside restaurant and former speakeasy in Pismo Beach and transformed it into what was literally an overnight success: they were inundated the very first night, and the action hasn’t stopped since. From the beginning, F.McLintocks Saloon and Dining House specialized in oak-pit barbecued steaks, ribs, and fresh seafood. Today the original McLintocks Saloon & Dining House continues to thrive. 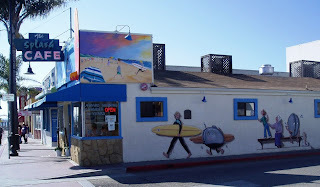 Over the years it’s been joined by four other establishments: three F.McLintocks Saloons (in San Luis Obispo, Arroyo Grande, and Paso Robles) and Steamers of Pismo. The three Saloons are casual, high-spirited places, offering smaller menus (but large portions) and a full bar. Steamers of Pismo, perched on a seaside bluff with non-stop views from within, is as casual and friendly as its older kin. However, it’s far more elegant. And thanks to its young and innovative chef, Danna Vachal, Steamers offers a much more sophisticated menu. I chose Cioppino for my main course. This dish, a favorite of mine, is a real test of a kitchen; badly-prepared Cioppinos can be watery or stingy with the seafood. At Steamers I enjoyed one of the best Cioppinos I’ve had. The tomato-rich and slightly spicy broth held its own and was packed solid with fresh giant prawns, clams, mussels, scallops and hefty pieces of fish. It was paired with an excellent local wine, the Kenneth Volk 2007 Pinor Noir. Steamers aptly manages a very difficult trick: it's a big, popular, beach town restaurant with a fast turnover and a widely diverse clientele. By definition it needs to cover a gustatory waterfront, with enough on the menu to please the Steak Set on one hand and more cutting-edge eaters like me on the other. It seems almost impossible to accommodate both ends of that spectrum, doesn't it? But Steamers pulls it off with room to spare. Try to check this place out if you visit; if you do, let me know what you think. We started off our final Central Coast day with an exploration of Pismo Beach—which, even though it’s on the central coast, has a real solid Southern California feel to it: it's a high-spirited beach town with golden sands, a walking pier lined with fishermen, surfers strutting their stuff, kids building sand castles and exploring tidal pools. And there’s a lot more here, including fishing, golfing, horseback riding, surfing, and kite boarding. We spent an hour or so at the Monarch Butterfly Grove, where docents gave us the low-down on these amazing critters who fly hundreds of miles every year to winter on the coast amidst eucalyptus. While in residence they mate. Before departing, the females leave their eggs to hatch on milkweed. During the peak winter season (late October through February) Amtrak offers a “Butterfly Train” that brings spectators to the butterflies—the Grover Beach train station is within walking distance of the Grove. After a classic Pismo “beach lunch” at the Splash Cafe—famed for its clam chowder and other seafood dishes served up in a hectic and fun atmosphere—we ventured a few miles out of town for our last stop on this Central Coast getaway. Our destination was the Guadalupe-Nipomo Dunes Preserve, sometimes called the Oceano Dunes, where sand dunes can reach as high as 550 feet. In a state with many wonders, the dunes are a standout. They stretch for 18 miles along the coast to comprise, at 22,000 acres, one of the most ecologically significant and intact coastal dune ecosystems on the planet. Boardwalks and bridges allow you to easily walk from the entrance, across the dunes and myriad waterways, to the beach. Waterfowl abounds along the way, and you'll also spot small a variety of small animals who live in the brush. One of the interesting aspects to the Dunes: back in 1923 Cecil B. DeMille filmed the classic movie, The Ten Commandments, here. 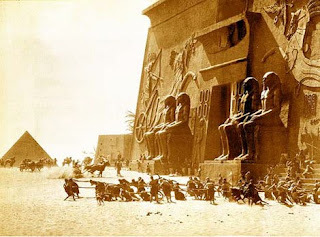 When the filming was over, the set was dismanted and buried beneath the sands. Most if it is still there. At the Dunes Center in the nearby town of Guadalupe, you can take in a fascinating exhibit that features a few artifacts from the set. And so it was back to the S. F. Bay Area--not a bad place to be at all. But I'll be looking forward to a return visit south, to spend time once again on my state's beautiful central coast. 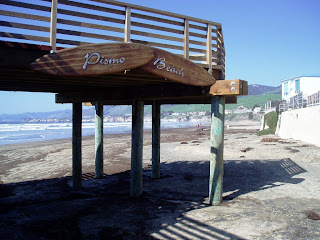 Part 3 (this post) discusses Avila Beach and Pismo Beach. Suzie, we've always loved stopping at Avila Beach either on the way down to or back from L.A. We're particularly fond of the fishing pier with a very nice restaurant on the end. Also, the Fat Cat Cafe (I think that's what it's called) nearby. I'm happy you wrote about it - lovely article. Thanks, Monica: That was my first time in Avila Beach, but from now on it's on my "must" list when I'm on that part of the coast. What a charming place!